The news just can’t seem to get better for Credit Solutions of America. It seems like every time I turn around they are getting sued by another state. This time it is the Vermont Attorney General, William H. Sorrell, filing suit against Credit Solutions. Perhaps he didn’t get the TASC and USOBA memo that high upfront fee debt settlement companies are somehow good for consumers. Or maybe he did receive it, recognized it for the BS that it was, and then went right on busting these guys. The lawsuit alleges that Credit Solutions used unsubstantiated “results” claims to advertise their debt settlement services on the Internet, failed to properly notify consumers of their right to cancel their contract, and charged fees up front in a manner that amounted to an unfair trade practice. Hmm TASC and USOBA are saying front loading fees is imperative to a consumers success, and the Attorneys General that are investigating these programs seem to be saying it is an unfair trade practice. The Vermont Lawsuit against Credit Solutions seeks injunctive relief, refunds and other compensation to consumers, civil penalties, fees and costs, and other appropriate relief. I also heard a rumor from someone who heard a rumor, from someone else that heard a rumor that Credit Solutions might be closing their doors. Hmm, so is that like a rumor twice removed? Well since I can’t substantiate that rumor at this time, I don’t know if it is true, but if Credit Solutions doesn’t turn things around in a hurry, they may not find many States left that they can do business in anyway. Sounds like Credit Solutions of America’s credit is out of whack. 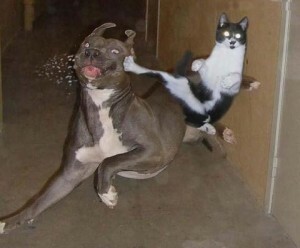 The cat in the pic is Vermont the dog is Credit Solutions. Credit Solutions is gettin’ the beat down. Funny pic, made me laugh. I am glad you appreciated the picture. I thought it was pretty funny myself and couldn’t help but use it for this post, considering Credit Solutions sent me a cease and desist letter but at the same time, they are getting sued in several states with the Attorneys General alleging the same things that they claimed were false and misleading on my blog. I wonder if Credit Solutions will also be sending cease and desist letters to these Attorneys General to let them know that their allegations are off base and that the complaints from consumers are not real? They sent you a cease and desist letter? What’s their basis for it….libel or slander? If so, that’s a pretty big stretch. Any simple Google search of their name pulls up tons of pages claiming scams, rip offs, and fraud. I’d say your post is pretty nice on CSA compared to other stuff out there, but then again I’m sure CSA sent them all a cease and desist letter as well. Good luck, I’m sure nothing will come from that letter. CSA needs to focus on their lawsuits and rebuilding the rep, if that’s possible. Ya, Well they didn’t really have a basis except to say that what I was saying was either false, misleading and/or designed to damage their reputation. Well, my response was pretty much that, if they can show me anything I have wrong I will correct it, and that most everything I said I found in the public domain. I haven’t heard anything from them since.